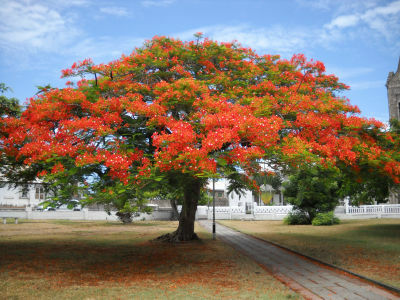 The National Flower of St. Kitts and Nevis is the Poinciana or Flamboyant, named after Monsieur de Poincy, the first French Governor of St. Kitts, who is said to have introduced it to the region. Its scientific name is Delonix Regia, and is said to have originated in Madagascar. The Poinciana Tree blooms from May to August, and can generally be seen along roadsides or off by itself. It is a fast-growing tree that grows 25 - 40 feet. It requires a deep soil, but can tolerate dry climates. The flamboyant is one of the most beautiful trees of the tropics, with its umbrella-shaped crown, fernlike compound deciduous leaves, and huge red and yellow clusters of scalloped flowers followed by long, black seedpods. The seedpods are locally referred to as "Shack-Shack", because of the sound they tend to make when shook. Today, there have been 26 visitors (42 hits) on this page!